The haunted history of the Alex Johnson Hotel in South Dakota has intrigued those interested in unexplained phenomenon and ghost stories all throughout history. Alex Johnson founded this particular hotel. He was known as the “Vice President” of what was referred to as the “Chicago and Northwestern Railroad” at the time. Many knew him for his love and admiration of the Sioux Indians. When he designed the hotel, he took his love for the Indians of the Plains and his consideration for the immigrants from Germany and meshed them to create a beautiful structure that everyone who would come to experience in person would love for a lifetime. In this haunted places to go travel guide, you will be introduced to the haunted history of the Alex Johnson Hotel in South Dakota. In the year of 1927, a group of individuals gathered to begin work on the magnificent hotel that Alex Johnson established. An interesting fact surrounding the hotel construction is that it started just one day prior to the beginning of the project on Mount Rushmore. On the first day of July in the year of 1928, the hotel officially registered its very first guest. Johnson set out to create what he referred to as “The Showplace of the West”. This “showplace” would be a unique collaboration of a tribute to the Indians of the area, as well as to the immigrants from the Germany area. Johnson was successful in establishing his tribute and creating the hotel that many notable individuals would stay at. While there are many different hauntings that are said to occur at the Alex Johnson Hotel, one of the most popular stories surrounds a female entity often referred to as the “Lady in White”. It is said that a woman haunts the area of the 8th floor in the Alex Johnson Hotel. It seems that she focuses on room 812. The story of her death is very interesting. It is said that she often resided at the hotel and was a pleasant character. Unfortunately, at one point, it is believed that upon staying at the hotel, she jumped from a window on the 8th floor and fell to her death. Those that actually knew the lady personally did not feel as if the death was a suicide, but all the evidence pointed to this. It is believed among those that knew the lady personally that her death was a murder that was related to the fact it was believed that she had money. Today, many individuals have experienced an eye witness account of what appears to be a female spirit in a gown that is white in color. It is believed that she is in search of answers surrounding her death and that she wants others to know that her death was not a suicide. In the early morning hours, many that reside in the room and even those that work at the Alex Johnson hotel state that the window is open – with no explanation as to “why”. In addition to this, the dresser located in the room often experiences some ironic changes. It is common to find that the drawers are placed upside down. Furthermore, unusual sounds that cannot be explained are often heard throughout the 8th floor of the hotel. Many individuals who have witnessed photographs of Alex Johnson himself have claimed that his spirit remains within the structure. It is believed that the structure brought Mr. Johnson so much happiness in life that he cannot bear to leave it in death. While many investigators state that this haunting is likely a residual, or a type of historical “recording” of Alex Johnson, there are many that believe that this spirit is aware of its surroundings and attempts to interact with the living. If you visit the Alex Johnson Hotel, it is important to make certain that you explore the 8th floor. Above all, this floor appears to be the most active. It is not unusual to hear the faint sounds of ghostly piano music filling the corridors, to hear distant conversations that cannot be pinpointed, or even to hear the faint sobs of a female that is extremely unhappy. It is not unusual to see an apparition floating by, or standing at the foot of your bed. Many objects have even been reported to move on their own – without the assistance of the living. 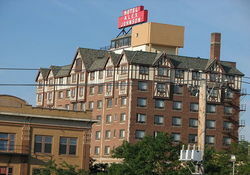 If you are interested in haunted places to go in South Dakota, check out the haunted Alex Johnson Hotel! Check for the lowest price, get directions, view photos, and read the reviews and traveler tips for the Hotel Alex Johnson.